Back at the Florida spaceport, expected cloudy weather never developed and SpaceX was counting down to a planned 7:36 p.m. 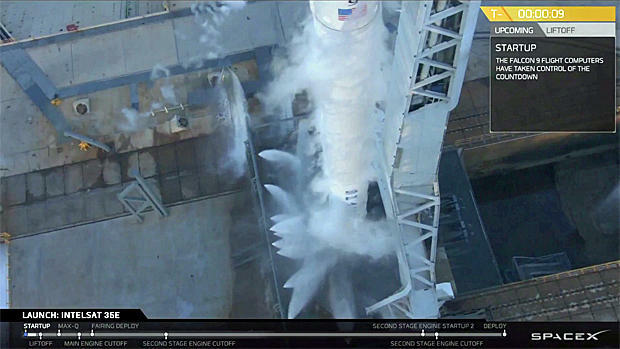 ET Sunday liftoff when the countdown abruptly halted at the T-minus 10-second mark. Engineers reported an apparent out-of-limits reading in the rocket's guidance and navigation system. Forecasters predicted a 60 percent chance of acceptable weather Monday for a planned launch at 7:37 p.m. ET. The goal of the mission is to launch the Boeing-built Intelsat 35e communications station, the fourth in a series of high-power satellites, this one bound for an orbital slot 22,300 miles above the Atlantic Ocean to provide service primarily to Latin America, the Caribbean and western Africa.